Background: In a career in business and professional sports that spanned over 70 years, Tom Benson was an endearing figure in his hometown of New Orleans as well as throughout the NBA and the NFL. Mr. Benson served as the owner of the New Orleans Pelicans since 2012 and the New Orleans Saints since 1985 until his death on March 15, 2018. He was survived by his wife Gayle. By the 1980’s Mr. Benson had built a highly successful network in the automotive and banking industries in both Southeast Louisiana and South Texas, but while a fan of the game of football and the Saints, the sport had yet to become one of his passions. 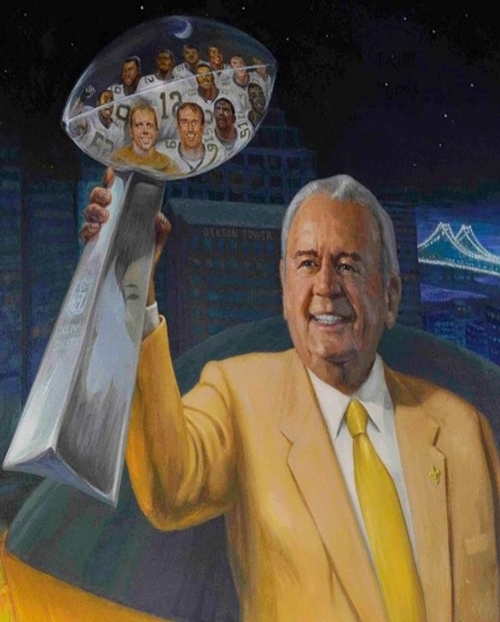 However, he realized the importance of the New Orleans Saints to his hometown and on May 31, 1985, he purchased the team after learning that the NFL franchise was on the verge of being sold to parties interested in relocating the team. Not surprisingly, success soon followed as the Saints entered the most compelling and memorable period in franchise history under Mr. Benson’s leadership after having previously not enjoyed a winning record or a playoff berth. In 1986, in one of his first personnel moves as Owner, he hired Jim Finks as president/general manager and Jim Mora as head coach. In 1987, the Saints broke through with a 12-3 record and hosted their first playoff contest. In its first 17 seasons of existence, the Saints won a total of 73 games. Under Benson’s guidance, the franchise exceeded that win total in only eight years by 1992. The Saints reached even greater heights in 2006, when he entrusted Executive Vice-President/General Manager Mickey Loomis to hire Sean Payton as head coach and sign free agent quarterback Drew Brees. Since those moves, the franchise has reached its highest point of success, posting a 119-85 overall record over the last 12 years, capped by the Super Bowl XLIV Championship. Overall, since being purchased by Mr. Benson in 1985, the Saints have earned 11 playoff berths, six division titles and captured Super Bowl XLIV in 2009, building a foundation for continued success, on and off the field. 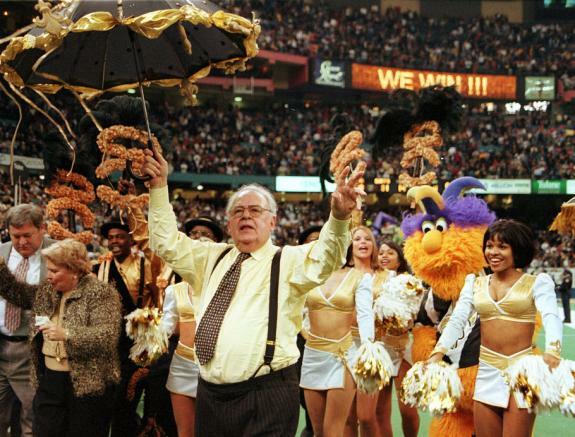 Mr. Benson’s commitment to winning and serving the community was an opportunity to reward the team’s fans, whose support has reached new heights with the Mercedes-Benz Superdome being sold-out on a season ticket basis for every campaign since 2006, with a waiting list of over 73,000 people. By the end of the 2017 season, the consecutive sellout streak had extended to 122 games. Mr. Benson also played a key role among NFL owners in various capacities for his 33 years of ownership of the Saints, including serving 25 years as Chairman of the Finance Committee, one of the League’s most difficult, time-consuming and influential positions, with his most recent term ending in 2013. The assignment was evidence of the respect and esteem in which successive NFL commissioners and his fellow owners held him. In 2012 Mr. Benson purchased the Hornets franchise from the National Basketball Association, which was successfully rebranded as the Pelicans. The objectives in his ownership of the basketball team were the same as his stewardship of the Saints: to produce a team on-the-court that will compete for championships every year, while making a significant positive impact off-the-court in the community. Upon the ownership transfer, construction immediately started on a state-of-the-art basketball practice facility adjacent to the Saints practice fields, which now comprises the Ochsner Sports Performance Center, with the entire Pelicans organization being housed together for the first time in the franchise’s history. Through agreements with the state of Louisiana upon the purchase of the Pelicans, the Smoothie King Center has undergone nearly a complete renovation since the 2012 purchase, featuring a new center-hung HD video scoreboard in 2015, along with several fan upgrades. On the court, after Mr. Benson inherited a team that finished with the worst record in the NBA’s Western Conference in 2011-12, the Pelicans have built through a combination of the draft, free agent signings and trades to become a stable and successful organization, reaching the playoffs for the second time in 2018 since the purchase of the club, advancing to the second round.